Our Beautiful granddaughter Cheyenne Autumn, came into the world at 7:07 P.M. by way of C-Section, on Oct. 11th. Our daughter Miranda, requested Mom be in delivery. As soon as Cheyenne was born, she was handed to me. It was Love at first site. Cheyenne joined Sister Sierriah, age 2 yrs. and 7 months at home. They became the Love of our Lives, and as they grew, became their own individuals. Sierriah had become a Pappy's girl, while Cheyenne a Nans girl, while remaining the Apple of their Mommy's Life. 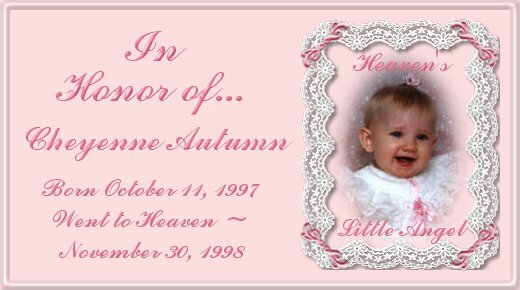 Cheyenne learned to walk at 9 months,loved to Play Ring Around The Rosie, with Sierriah. Loved to play, No More Monkeys Jumping On The Bed, with Sissy, both laughing so hard. Loved to dance to Music, especially Barneys music. Playing with Nans Special Basket of Flowers, carrying them everywhere. Sierriah and Cheyenne learned to ride their Tricycles and Loved to play in the back yard, and swim in the pool. Cheyenne was nicked named "Shawnee", by sierriah, who could not say Cheyenne Autumn. Shawnee had a real habit of pulling on her Sister's long brown hair. And they would wrestle around the living room. 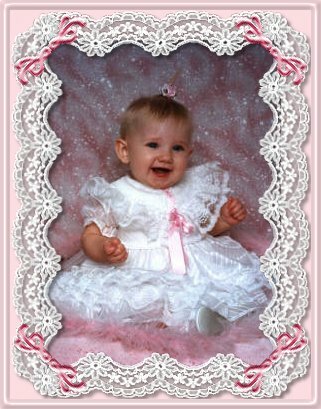 All graphics and content on this website are ©copyrighted to "Heaven's Little Angel" and may not be reproduced without express permission.